VIENNA Advantage > Retail Industry-Template > How to manage bar codes with VA POS in Apparel and Fashion Retail? VIENNA Advantage POS is a generic POS that easily adapts to any retail business no matter whether it is a supermarket, department store, pharmacy, apparels or grocery store, restaurant etc. In this article we are going to explain some basic features when using VIENNA Advantage POS in apparels retail business. > How to use scales with VIENNA Advantage POS System? So let’s start with the products first, and examine the following case: you have a pair of shoes in different variants (size, color, etc), and you do not maintain, or you do not want to maintain, different bar codes for different sizes, colors…All shoes variants from a specific shoes model are kept in the system under one bar code. This situation is very confusing and may lead to irregularities in the stock management. Big apparel retailers usually do not work like this, because this consumes time and there is a higher entry error possibility caused by human factor. In order to avoid errors, big retailers use separate bar codes for each shoes variant. But this is not the case for smaller apparel retailers. They usually use one bar code for all shoe variants. So how VIENNA Advantage POS helps small retailers solve this problem? In order to sell the products through the VIENNA Advantage POS you first need to set up some product attributes in the material management (back – end) that is connected to the POS. After doing this, next step is to manually enter stock under each product variant. 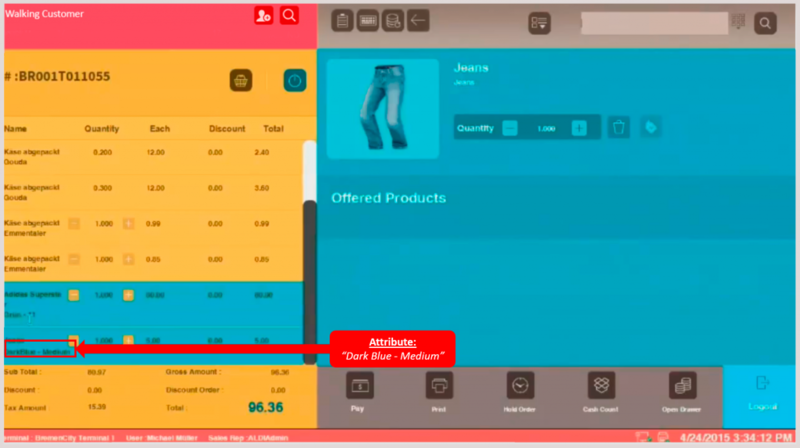 When you are done with this step, you can sell the products through the POS system. When scanning the product bar code (in our example the shoes), the POS system would like to know for the accounting and keeping of the stock entries, what is the shoes variant that you are selling? In our example we have set up 2 variants: size and color. See picture below. 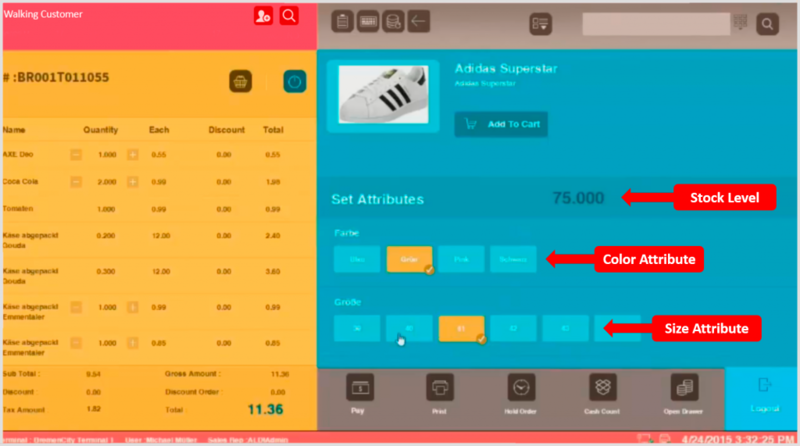 Choose the size and the color of the shoes, and you will automatically see the stock level (quantity on hand) on the POS screen. After selecting attributes click “Add to Chart” button and you can continue with scanning new products or close the order. Similar case to this one is when you have one product with different LOT numbers that have different prices. Different LOTs means different expiry dates. This is usual scenario when a retailer wants to sell the older goods first, for which he sets up a discounted price. This scenario is applicable both for big and small retailers. As we mentioned at the beginning of this article, big apparel retailers usually assign separate bar codes for each product variant. If this is the case, when scanning a product variant with assigned bar code, for example jeans (color: dark blue / size: medium), the cashier will immediately see these attributes on the POS screen (in the Order Section, as a separate new line). See picture below. VIENNA Advantage POS is everything you need for your store, accessible from wherever you sell!